Every mum deserves to feel special especially on the one day of the year dedicated to all mothers around the world. Australia celebrates Mother`s Day this on Sunday 8th May 2016. 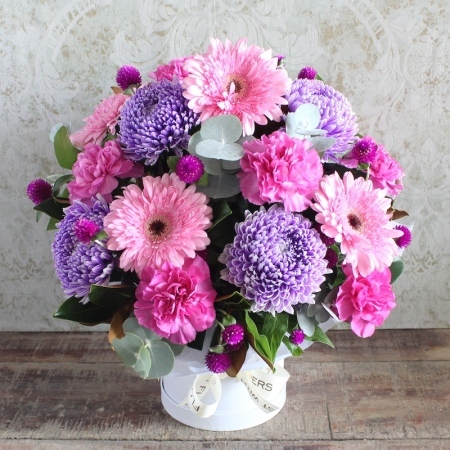 On this we celebrate motherhood and maternal bonds keeping this in mind our team of florists have created `Femininity` designed with around a base of modern day disbud mauve chrysanthemum`s, pink gerbera and carnations in an simple hat box. Order this classic arrangment online of phone us on 02 9871 1666. To help Mum celebrate have a look at our range chocolates, wine or champagne to enhace this lovely arrangment.